Home » Ultraterrestrials or Pilots of the Spaceways? “We are well aware that the word humanoid is not in the dictionary;” wrote Charles Bowen, editor of the United Kingdom’s world-renowned Flying Saucer Review, “that it was coined somewhere along the line by a writer or researcher. Nevertheless it seems to suit our purpose far more than those other words of anthropology like hominid, which means kin of man (Neanderthal man was one of these) and hominoid, which means man-like ape.” These were the words that formed part of his foreword to Gordon Creighton’s anthology of cases from around the world entitled – what else? – The Humanoids (Chicago: Henry Regnery, 1969). This far-reaching book, published only a few years after it became acceptable to speak openly about the possibility of UFOs having occupants. Bowen also drops the hint that Dr. Edward Condon and his committee had access not only to The Humanoids and issues of FSR in assisting with their evaluation of the phenomenon. plastic suits with bubble helmets and tanks strapped to their backs. As has been exhaustively documented in many other places, UFO research – or more specifically, UFO culture – owes a great deal to science fiction, particularly when it comes to the conceptualization of vehicles and occupants. The notion of the “silver-spacesuited alien” so common to early occupant reports and contactee chronicles may owe a lot to the iconic vision of Michael Rennie’s Klaatu descending from his spaceship in The Day The Earth Stood Still, or at a later date, the widely circulated promo photos of the Robinson family in CBS’s Lost in Space, coolly posed in silver one-piece outfits with red piping and boots to match. In real life, the vision of the silver-suited astronaut was turned iconic by the Friendship 7 astronauts, wearing their Mylar-covered spacesuits developed from the pressure suits used by pilots on stratospheric flights. Changes would later be made to the silver spacesuit by the time the Gemini Project rolled around, allowing for greater mobility under pressurization than the Mercury Project original. The need to perform extra-vehicular activities (EVA) and eventual lunar landings caused new suits to be developed and the striking silver outfit to be relegated to museums. It appears, however, that ufonauts did not receive the memo. Reports of humanoid occupants in silver suits remained unabated, even up to quite recent times. Dr. Anthony Choy, one of Peru’s best known researchers, looked into one of these cases as recently as 2002, this time in the community of San Bartolomé in the Peruvian highlands, specifically in the province of Huarochirí, several hours to the north of Lima, the capital city. The picturesque town is known for its variety of fruit trees and otherwise excellent weather, boasting nearly year-round sunshine, filled with forests (Bosque de Zarate being the best known) and abundant wildlife. Not a grim or ominous location in the least. The case involved two witnesses, the main one being Luis “Lucho” Rojas Povis, 51, a toll booth operator who happened to be outdoors at two o’clock in the morning with his best friend when both men became aware of “two figures” making their way down the slopes of Cerro de la Pascua, clad in silvery outfits. Initially, the onlookers did not find anything unusual about them, believing them to be mountain climbers or official personnel in outlandish protective gear. As the figures approached there was the awful realization that things were not quite as normal as expected. The entities were described as having “an athletic build, slender and tall” with form fitting silver outfits. Their faces looked human, but their eyes were described as “shining”, and they didn’t walk as much as float above the ground. They did not utter a single word. Astonished beyond belief, Rojas and his friend walked up to the strange new arrivals; the friend even reached out to touch the face of one the entities to see if it was “real”. One of the entities slapped the probing hand away, shocking the human. “Hey, why are you messing with my buddy?” the toll booth operator challenged the creature, according to Dr. Choy’s interview. But what could have become the first mano-a-mano between humans and non-humans (since the 1954 case involving José Ponce and Gustavo González in Venezuela) was interrupted by the unexpected arrival on the scene of a taxicab whose passenger and driver were about to become the next set of witnesses to the mind-bending situation. Beatriz García, 34, had just taken a taxicab back to San Bartolomé at that late hour from the town of Ochocica, where a fair had been held that day. Agreeing to pay the driver a rather high fee for the journey home, Ms. García was startled to see “a man made of pure tin, or dressed in aluminum” standing at the edge of the road. She was only able to see one figure, but could not say if it was the entity that slapped away the man’s effort to touch its visage. The driver became very agitated by the unearthly sight, and his nervousness caused her not to look very closely at the being, while having noticed its “brilliant” eyes. During the interview with Anthony Choy, she estimated that a distance of ten meters separated her from the entity, which appeared to be “walking back and forth, two steps forward, two steps back, but actually floating in the air.” She coincided with Rojas’s description of the creature’s dress, the form fitting nature of the outfit, its helmet and general build. A silvery-suited “humanoid child” is at the center of a highly complex “Julio” case of 1934, re-opened by Magdalena del Amo-Freixedo in the late 1990s.”…the girl had a pinkish complexion and wore a silvery suit. She was small, like one of our six year-old girls, with platinum blonde hair. I don’t remember the color of her eyes,” said the experiencer. More ominous is the tall figure with empty eye-sockets that played a role in the 1973 case involving a Puerto Rican housewife. The entity – humanoid in shape, towering and wearing a tight silver outfit – projected the words “cerakia ovnit” into the terrified experiencer’s mind, words whose meaning remains a mystery forty years later. Another entity seen in the Spanish province of Zamora in 1974 was described by the percipient as being over six feet tall, with arms held closely to the sides of its body, and having an overall “military” bearing. It was also noted that the creature appeared to have been “made of silver” and glided away into a hill when the witness pressed his hunting dogs to attack it. Guillermo Giménez of Argentina’s Planeta UFO looked into a case that occurred in Necochea, Argentina in February 1988, involving entities wearing tight-fitting costumes. “The fact is that they’d go completely unnoticed among us if they wore normal clothes and not those silver coveralls,” noted the interviewee. Three summers before the incident involving the San Bartolomé humanoids, a skywatcher in neighboring Chile had his own brush with the unknown. Enrique Bermúdez had driven to the outskirts of Punta Arenas, which aside from boasting the privilege of being Chile’s southernmost community, the city on the Brunswick Peninsula is also one of the largest one in the Patagonian Region. The clear skies above beckon to skywatchers and amateur astronomers, or simply anyone wanting to enjoy the unspoiled night air. It had also become famous in flying saucer circles for a famous “radar confirmation” case involving a warning issued by an air traffic controller to a passenger plane, advising it to be aware of unknown traffic in the area. Bermudez had no idea that he was about to enter the pages of UFO lore on September 22, 1997. 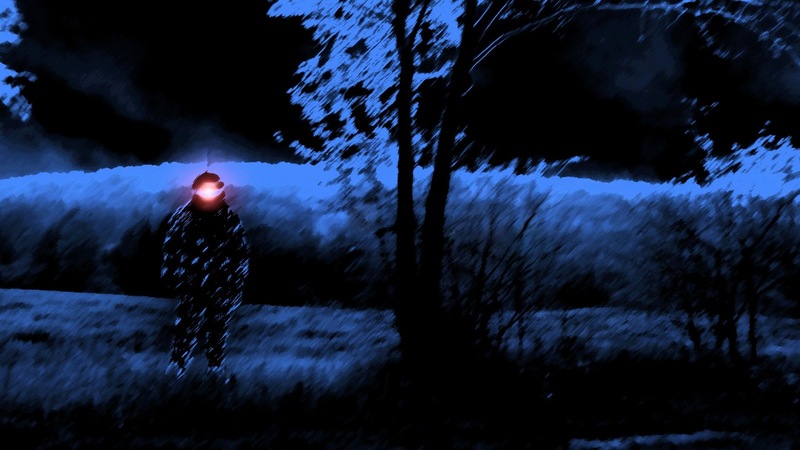 The man were startled to hear a strange sound outside, and upon turning off the headlights to eliminate the glare, he could see short humanoid figures running around the vehicle. According to the description given to researchers, the entities were “small, standing around one meter tall, with long arms and oversized heads,” but their facial features were could not be clearly seen in the darkness. A total of eight short beings now surrounded his car, besieging him behind the wheel for an estimated 40 minutes. When they finally ran off into the forest, the witness started the car and drove away. He would return – bravely – a week later with a researcher from Chile’s AION group, Dr. Carlos Muñoz, who had joined the organization in 1996 and become one of its most active field investigators. Both men descended from the vehicle and were startled to see a truly unusual sight: a source of light resembling a red neon tube was hovering in the darkness some twenty meters away from them, pulsating as it did so. Muñoz lifted his camcorder to shoot footage of the uncanny phenomenon, but to his surprise, the light source did not appear in the viewfinder. Bermudez and Dr. Munoz found their nerve beginning to fail them. They re-entered the car and drove away from the forest. On June 4, 1978, two brothers – Juan and Héctor Juárez , ages 10 and 8 respectively– were walking back home from school to their humble home in the El Corito neighborhood of Ciudad Cárdenas in the Mexican state of San Luis Potosí. As the boys walked past Zaragoza Street, they saw activity in the empty field that served as a makeshift soccer pitch. Other children of around their age seemed to be engaged in frantic activity, and not wanting to be left out, Juan and Hector walked down the street and on to the empty field. While separated by a distance, the boys were suddenly realized that the figures were not their neighbors or classmates having a post-school day game of futbol, but something they’d never seen before. The figures were not children, although their height was comparable to boys their age. The two brothers found themselves facing between fifteen and twenty creatures darting around the field. Far from fleeing in terror, Juan and Héctor approached, curiosity getting the better of them, and making an uncanny discovery: the kid-sized figures’ feet did not touch the ground. They darted on air, moving as if on roller-skates. Some of the creatures – with devices on their backs that the two brothers could not recognize – interrupted their play to look at the humans. Something, in retrospect, the Juarez Brothers wished they had not done. The creatures had humanlike features – the faces of adult humans on childish bodies – but their oval heads had eyes set so close together as to make them resemble the legendary Cyclops. Terrified by the sight, Juan and Héctor broke into a mad dash for the imaginary safety of Zaragoza Street, and the prospect of reaching their home. Héctor tumbled to the ground a few times, weighed down by the contents of his book bag. There are contradicting sources as to what happened next. In one version, the beings took to the air, flying up and away , enveloped in a white light, as if though having been spotted by the young humans marked the end of their escapade. In another, the boys ran to their home, only to find their mother standing outside, gazing skyward at a strange light in the sky that “looked like the sun” due to its brightness, thinking that “strange birds” were flying in the air toward the light, unaware that they had taken flight precisely from the field that her two children were running home from. The mother contacted the authorities and law enforcement agents questioned the boys, asking if they had slept well the night before the incident and if they “knew anything about UFOs or extraterrestrials”, questions to which the youths replied yes and no, respectively. Pressed by the uniformed grown-ups as to what they had seen, one of the brothers piped up: “Some children, but they weren’t like us.”There was no follow-up to the astonishing account and the percipients were never heard from again, despite the inquiries made by two separate Mexican UFO research groups. For some reason, an alternate date of March 30, 1979 appears as the date of the event in some sources, questioning the veracity of the whole ordeal. The truth of the matter lies with two boys – now men in their Forties – who are probably still trying to put the nightmare behind them. The warm temperature and spectacular starry skies on the evening of June 15, 1974 were enough of an enticement to prompt to neighbors – Dolores and Marisa – to go for a nocturnal stroll in their town of Manzalvos, in the Galician province of Ourense (Spain). The two friends had no idea that their spur-of-the-moment constitutional would land them in the pages of the chronicles of the unknown. Veteran ufologist Marcelino Requejo, who had relatives in that community, included the experience in his book OVNIS: Alto Secreto(Ediciones Cydonia, 2009). He was able to pay a visit to the community and interview the experiencers in person. The friends were further shocked to see two humanlike silhouettes, perfectly black, emerging from either end of the oblong light, walking slowly toward each other, their paths crossing in the middle of the light and each heading in the opposite direction from which it had first emerged. What astounded Dolores was that the silhouettes walked with the precision of “soldiers standing guard in front of a building.” This maneuver repeated itself for a few minutes while both friends, now patently terrified by the enigma playing out before their eyes, sought shelter behind the corner wall of a village alleyway. Even more astonishing to them was the fact that the luminous oblong shape began to collapse inward on itself, becoming once more a thin, bright light that vanished into the dark. The two powerful red lights reappeared at the either end of what had been the rectangle and slowly rose into the air, before lurching suddenly into the starry night, vanishing out of sight. Both women ran home to tell their relatives about the unsettling and outright bizarre event. Ufologist Requejo mentions, by way of comparison, other cases similar to the 1974 experience in Galicia, sometimes involving larger groups of witnesses, but featuring the “projection screen” feature witnessed by Dolores and Marisa. While clearly a display of some sort, one wonders if it was aimed at the witnesses, as the humanoid “actors” were oblivious to the presence of witnesses in these cases. It could be another example of the ‘pointless’ activities that UFO occupants have been seen engaging in since the early days of the phenomenon, ranging from collecting useless specimens of soil to asking terrified humans for the time of day. Up until to the abduction paradigm of the 1990s, it could be argued that a nocturnal road trip through a desolate area in any part of the world was the likeliest location to have a UFO experience – any of the three CE-types – and some researchers of the ‘70s even cautioned their readers to have care when driving alone under such conditions. This was clearly the case in Chile in 1965, when medics aboard an ambulance on an emergency call became the unwilling witnesses to a brilliant light descending from the night sky, surrounded by a host of lesser, attendant lights, that eventually came to rest upon a plain. As the wary ambulance driver drove on, given the urgency of his mission, he was shocked to find one of the smaller objects intercepting his vehicle on one of the curves on the road. One of the medics would later report seeing – lost amid the glare – what appeared to be “figures moving behind portholes”. Even more disturbing was another medic’s recollection of seeing a creature’s face looking at him through one of the side windows, “being dominated by its eyes”. Chilean researcher Rodrigo Fuenzalida has looked into his share of these cases, which have made Chile one of the world’s foremost locations for encounters with the unknown for well over fifty years. During a radio interview on the “De La Noche a la Mañana Radio Show” on Radio Cooperativa, the researcher brought up the eerie case of Mr. and Mrs. Juan Munizaga, who were traveling to the coastal city of Viña del Mar in 1983. In their Forties, highly respected and both occupying important jobs, the last thing the Munizagas expected at two thirty a.m. as they drove down Route 68 was to be inducted into the annals of humanoid contact experiences. At some point along the dark road – the vicinity of Casa Blanca being mentioned – the couple saw figures ahead on the asphalt that they first took to be “horsemen on their respective mounts” riding on the paved surface. As the figures did not make way for the motor vehicle, Mr. Munizaga slowed down, turned on the high beams, and cast light upon creatures standing two and a half meters tall (8.2 ft.) with white hair, enormous eyes and “celestial” tunics “like something out of a Hollywood production”, as they would later describe them. Even more perplexing was the description of “shoulder pads with electronic circuits that came out of their necks” and the emotionless features of both giants, one of whom the Munizaga’s distinguished as possibly being female by its sharper features and somewhat ruddier complexion. Fuenzalida uses the term “feminoid” to describe the possible giantess, who made her way to the car and looked into the passenger side window, casting her enormous eyes on a terrified Mrs. Munizaga, who curled into a fetal position on the seat in a vain effort to shut herself off from the unknown; Mr. Munizaga is reported to have cursed out loud “why didn’t I bring my revolver with me”. The encounter with the towering humanoids in their glowing raiment reportedly lasted three minutes, after which one of the beings stood aside and the driver was able to accelerate past them. Mrs. Munizaga looked back and reportedly saw one of the creatures making mechanical gestures with its arm, beckoning them to return. “These entities,” notes the researcher, “belong to the classification of tall beings in luminous outfits that give off some form of unknown luminous energy. Their morphology is generally human, but their eyes were twice as large as normal human eyes.” Another couple had a similar experience in the same area in 1986, but in this instance, one of the entities raised a hand and caused the automobile to lose all power while its companion performed an “inspection” of the vehicle, walking around it. Once the first creature lowered its hand, the car was restored to normal and able to leave. But why the absurd behavior of circumambulating a car? “With UFO entities,” writes Hillary Evans in Visions-Apparitions-Alien Vistors, it is not possible to give them the benefit of such a doubt. Their conduct is almost always bafflingly meaningless to our eyes,” despite the fact that the behavior is clearly endowed of some sort of significance. Other authors suggest that these behaviors serve the purpose of misleading the witness, but why? With the Northern Hemisphere awash in sightings and bedroom invasions of “Grey” entities in the Nineties, it is notable that more traditional – but no less bizarre – events were occurring elsewhere with other non-human types. A 1998 case in Chile involved a family enjoying a day outdoors when they witnessed what they first took to be parachutists coming out of the sky, capturing the event on their camcorder. But no parachutes were ever deployed. The humanoid figures plummeting out of the sky suddenly stopped in mid-air, flying in formation toward the Pacific Coast. As if this detail wasn’t enough to move the case into the highest ranks of high strangeness, the family remarked that the erstwhile parachutists were gigantic – estimating them to be at least three meters tall and clearly visible in broad daylight. They seemed to be surrounded by a swarm of lesser lights (much like the object seen by the ambulance crew in 1965). Skeptics dismissed the incident saying the figures were “large trash bags sent aloft by local children.” (The video can be seen at YouTube URL http://youtu.be/V95qHv1b0t8) We see in this case a repetition of the “flying humanoids” that terrified the two boys in San Luis Potosí, Mexico, a decade earlier. Another significant Chilean case from the late Nineties – also from Rodrigo Fuenzalida’s files – includes a “bedroom visitor” that once again, was not one of the multitudinous Greys. On the evening of February 13, 1997, an unnamed young housewife was getting ready to put her baby daughter to bed before going to bed herself, as her husband worked nights. At one point, the woman heard a “buzzing” sound that came out of nowhere, electrical in nature, and when she glanced over to the bedroom wall, was alarmed to see a humanoid figure with a backpack and helmet materializing on the wall. The witness went to pick up her daughter in terror, as the unearthly figure seemed interested in the child. A curious detail is added: the helmeted non-human appeared to be “confused” – had it materialized in the wrong apartment or time, or the wrong dimension? The witness heard the buzzing noise again and the bedroom visitor disappeared, leaving behind a strange glow on the wall that remained visible moments alter. The outcome of this experience was hardly a positive one, as the woman refused to return to her apartment: she returned home to her mother and father, suffered a nervous breakdown, and could not be dissuaded from sleeping at the foot of her parents’ bed.